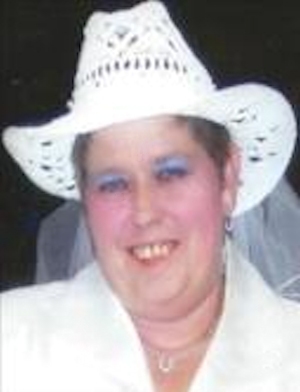 Obituary – Majors, Darla Dean (Shultz) « Perry High School Alumni Association, Inc.
Darla Dean Majors, 54 of Perry, passed from this life on Monday, March 31, 2014 in Stillwater, Oklahoma. 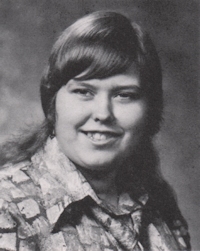 Darla was born on December 3, 1959 to Dean and Darlene (Thompson) Shultz in Perry, OK.
She was raised in Perry and graduated from Perry High School. After high school, Darla attended college for a couple of years before finding her calling in the healthcare field. She spent several years working at Perry Green Valley Nursing Home as a nurse’s aide. In the early 1990’s, Darla accepted a position at Perry Memorial Hospital as a scrub tech, nurse’s aid, and a home health provider, a job she enjoyed for more than nearly 20 years. Darla’s failing health forced her into early retirement in 2011. In 2002, Darla attended an auction and placed her bid on the auctioneer, Tom Majors and in 2006; Tom and Darla were married in an auction ring in Stillwater, OK. She enjoyed doing auctions with Tom and volunteering her time to work with him at Uncle Mike’s Auction and Novelties in Ponca City. Darla was a former member of the Perry Round-Up Club. She also enjoyed spending her time collecting elephants, attending garage sales and auctions, camping with friends and family, and gardening. Darla was a wonderful and caring woman with a huge heart. She was hard to get to know, but once you took the time to get to know her, she became a loyal and trusted friend. She had a wild sense of humor and loved being around auction folks, but she was never happier than when she was spending quality time at home with the love of her life, her husband Tom. Darla Majors packed a lot of special moments and beautiful memories into her short 54 years and she will be greatly missed by all who knew her. She was preceded in death by her parents, an infant son Jerry Don Bilyeu, and several other family members. Those left to carry on her memory are her best friend and soul mate, Tom Majors, of the home. A brother in law, Larry Majors of Pea Ridge, AR. Three Aunts: Lila Bay and husband Raymond, Melva Edgar, and Donna King. Special friends Mike and Cassie Battles, as well as other cousins, nieces and nephews, and other family members. Services have been entrusted to the care of Palmer Marler Funeral Home of Stillwater and a service celebrating Darla’s life will be held on Thursday, April 3 at 2:00 P.M. at Palmer Marler Funeral Home Chapel in Stillwater. Interment will follow at Sunset Memorial Gardens.